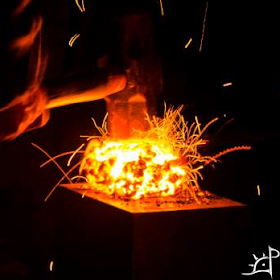 To the bladesmith, heat treating is, in short, the effect of time and temperature on steel to produce a change in either the grain or microstructure phase. The four main modes of heat treatment used in the processing of steel are annealing, normalization, hardening, and tempering. Throughout this examination of heat treatment, I will be using a variety of terms and ideas discussed in the previous two parts linked above. As an introductory look at the various interactions between the forms of the iron carbon lattice and relevant temperatures, please briefly examine the graph below detailing phase states for various carbon contents and temperatures. **Unless otherwise noted, all figures are from from "Metallurgy of Steel for Bladesmiths & Others who Heat Treat and Forge Steel", by Verhoeven et. al. Annealing is the general process of relieving internal stress in the metal lattice and results in a softer, more ductile member. The primary goal of annealing is to diffuse dislocations within the lattice into a state of equilibrium and, where possible, remove them entirely. Technically, normalizing is a form of annealing, but the differences in process and resulting material properties will necessitate a separate examination. Steels of higher hardenability, and by inference higher carbon content to an extent, require slower cooling to prevent the precipitation of Martensite. Alloyed effects have similar requirements on annealing times due to the separation of the Martensite start temperature Ms (when Martensite begins to precipitate from austenite) and Martensite finish temperature Mf (when Martensite lower temperature limit after which Martensite will no longer precipitate). The widening of the Ms and Mf temperatures mean that Martensite is able to precipitate for a longer amount of time (allows for slower quench speeds) and therefore necessitates a longer duration of cooling to prevent that same martensitic precipitation. One of the principle consequences of annealing, and often the reason it is done, is the relief of internal stresses. When the austenite reaches equilibrium and higher energy dislocations are allowed to become unpinned, those places which would have become nucleation sites for the formation of grains are relieved. Larger grains are typically undesirable for hardened steels, but in softer members it is of little consequence because of the increased malleability and ductility resulting from the refined ferrite and cementite. Not only does annealing soften the metal and make it easier for subsequent machining operations but it also helps relieve stresses from prior machining that results in surface dislocations which more easily lead to sites for stress fractures and brittle failure. Because I rarely ever anneal, I will not discuss the process at great length to avoid distributing misinformation. Similar to annealing (and as a form of it), normalization is also a thermodynamic process used to manipulate grain size and the lattice's chemical equilibrium. Unlike the previously described annealing, normalization refines the grains into smaller, uniform patterns. Like annealing, normalization requires the steel to be heated past its critical temperature and thus allow the formation of austenite. The longer the steel is soaked (to an extent), the more homogeneous the austenite will become. High alloy steel requires longer soak times due to the higher energy required for those larger substitutional atoms to diffuse through the iron lattice. Similarly, normalizing results in a softer steel of lower stress and improved ductility, malleability, and toughness. The notable difference between the two processes lies in the rate at which the steel is cooled. Instead of a very gradual lowering of the temperature, normalizing is generally done in still air. This is significantly more rapid and, as a result, can also yield a harder piece than one that has been annealed. Normalizing also has the key benefit of reducing grain size and therefore a more consistent response when the steel is subsequently hardened. For the bladesmith, this is extremely important, as improperly worked steels tend to warp, crack, or otherwise act unpredictably when hardened without normalization. Irregularities in the micro structure from forging are allowed to be relieved through normalization which also cause that unpredictable response to hardening. Because the cooling is more rapid than in annealing, austenite tends to precipitate into pearlite more rapidly and therefore with a shorter distance between interspersed cementite plates (resulting in a finer grain structure). In the application of heat treating blades, normalization has another key benefit. Throughout the process, the phenomena of decalescence and recalescence can be observed. For reasons discussed in the section on quenching, it is best to harden a steel as close to the critical temperature as possible (without going below) and that visual indication of phase for the given lighting conditions is made clear through the process of normalization if precise temperature controlled kilns or furnaces are unavailable. This is where the majority of the study of this examination will take place, in addition to a look at tempering. Due to the complex nature of phase transformation and meta-stable thermodynamic states involved with the quenching and subsequent tempering processes, there will be a fair bit of technicality to this. Before talking about all that, to put it simply, quenching is the hardening of steel by rapidly cooling it in order to achieve a state of the metal lattice's microstructure which would ordinarily not exist. This quenching process is what hardens the steel. -Curie temperature is the temperature at which a material becomes non-magnetic. The cause of this is the introduction of sufficient thermal energy for the magnetic dipoles become unaligned with respect to their neighbours. This happens in countless materials other than steel, including pure iron (which cannot form austenite) and is lower than and independent of the critical temperature. -Critical temperature is the temperature at which ferrite cementite transform into austenite. While austenite is paramagnetic by nature, it is not because its formation happens at a temperature above the curie temperature. -In a eutectic, binary iron-carbon lattice, the curie temperature and critical temperature are within a few degrees. However, the addition or loss of carbon widens the difference between the two, and the introduction of additional elements into the lattice makes the disparity larger still. Using a magnet, therefore, to judge whether a steel has transformed into austenite can serve as an approximation but an approximation alone. There are more accurate ways of determining the phase transformation. In the context of this larger discussion, quenching forms either Martensite or bainite, depending on the methods, mediums, and temperatures used. As with annealing and normalization, steel is quenched from an austenitic steel, or a steel whose metallic lattice is above the critical temperature and thus given the opportunity for its substituent ferrite and cementite to homogenize after transforming into austenite. When quenched from this austenitic state, that austenite undergoes a forced converted to Martensite as a super saturated body centred tetragonal crystal of approximately 1,5% carbon or greater. Because of the martensitic structure is thermodynamically unstable (meta-stable), that carbon would ordinarily have diffused into cementite upon more gradual cooling. Inside this Martensite, there is a tremendous amount of internal stress and pinned shear dislocations, which give it its relative strength and hardness, which is about 1,75x harder than pearlite. In addition to a change in micro structure and hardness, there is also a change in density. The Martensite has a lower density than the previously exhibited austenite, and therefore the steel expands during this phase transformation. It is the irregularities in formation of Martensite that lead to warps, cracks, and sori (curvature of a blade towards or away from the edge during hardening). Unlike the formation of pearlite, which holds to the same decomposition mechanisms from austenite regardless of the change in temperature, Martensite precipitates from austenite depending on the rapid change of temperature and the final temperature at which it is cooled. This faster cooling produces a few similar results as with the stable forms of the micro structure- the faster growth of individual grains and smaller grain sizes due to the increased number of nucleation sites along previous austenitic grain boundaries. The major difference between slow cooling and rapid quenching is that there lies a disparity in the formation of Martensite that heavily depends upon the rate at which it is actually cooled. Where pearlite will entirely replace the austenite from which it came insofar as the final temperature is below the eutectic temperature, Martensite will not form at all unless the temperature at which it is cooled is below the Martensite finish temperature. In the phase diagram of the iron-carbon lattice, there are only three possible phases the steel can occupy, ferrite, cementite, and austenite. While there are combinations of these three phases, they will not appear as something else in a thermodynamically stable system. The Martensite, however, begins to form between the Martensite start and finish temperatures, provided a sufficiently fast rate of change of temperature. If the quenched temperature of the steel lies between those two temperatures, a portion of the austenite will remain untransformed, and is called retained austenite. This reduces overall hardness due to the difference in structure of austenite and Martensite, and that remaining austenite can later transform into ferrite and cementite, which also reduces hardness. Because austenite is able to dissolve more carbon than Martensite, a steel of increasing carbon content is increasingly susceptible to retained austenite. Fully lath martensitic steels generally will not have significant amounts of retained austenite, which occurs in steels of ,60%C or less; but fully plate martensitic steels tend to be dramatically increased amounts of retained austenite, which occurs in steels of 1,0%C or greater. As would seem intuitive, steel is fully hardened when the maximum amount of Martensite is precipitated within the piece across its entire length and cross section. In order to achieve this maximum theoretical Martensite content, the rate of cooling must exceed a rate (unique to each grade of steel) throughout all of the present austenite. Due to the nature of heat transfer and thermal boundary layers and internal convection, the surface of a piece will always cool faster than the centre. If the quench speed is not fast enough to lower the temperature of the steel below the Martensite start temperature, other phases of the iron-carbon lattice will form in place of Martensite, and therefore be softer in afflicted regions. As previously discussed, grain refinement is an important part of heat treatment. After normalizing, grains will be smaller and more uniform. During quenching, Martensite precipitates along prior austenitic grain boundaries. Uniformity and predictability in the formation of Martensite during the quench is important to the overall shape and integrity once the quench temperature has been reached. Smaller grains lead to greater uniformity in martensitic distribution, which leads to normalized stress distribution. For thin pieces such as blades, unwanted distortion presents a significant problem. Although crack formation and embrittlement correspond to carbon content and quench speed across the Martensite start and finish temperature band, there are a few additional factors which can lead to catastrophic quench failure. 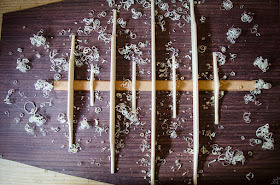 First, temperature uniformity dictates how a piece will react. If there are hotter regions alongside colder regions, that temperature banding will determine when the formation of the various phases can occur. Note that once pearlite or bainte (discussed later) precipitate from austenite, that portion of the lattice will not form Martensite without first being converted back to austenite. Second, the speed at which the steel is quenched can have a dramatic effect of stress introduction. Martensite precipitates from austenite at a speed close to the speed of sound in iron. Faster quenches mean more Martensite is forming within the steel in a shorter period of time, and therefore introduce high amounts of internal stresses more rapidly. This is generally why (in addition to a few effects of substitutional alloying) steels quenched inappropriately into water or brine have a much higher chance of failure. Third, when steel is quenched into a volatile liquid, the thermal boundary layer can cause an insulating effect and flash that liquid to vapour. The difference in temperature and density of the vapour compared to the bulk modulus causes an extremely complicated analysis of heat transfer, but in short tends to lead to warping and sometimes cracking. There are several liquids into which steel can be quenched, ranging from water and brine to molten salts, oil, and even liquid metals. Each have their own advantages and disadvantages, but the main difference between them is the severity of the quench experienced by the steel. Oil tends to be slower and more forgiving, water faster but with the more significant introduction of the vaporous jacket, and brine which is extremely fast but can mitigate some of the vapour effects. I may delve deeper into this at a later time, but for now I will leave it at that. When austenite is unable to fully transform into Martensite during the quench, a portion of that austenite remains as a metastable crystal within or around the Martensite. Due to the changes of volume that come with changes in the microstructure, retained austenite imparts a tremendous amount of internal stress to the steel. Steels containing more than ,30% C have a Martensite finish temperature below room temperature, which is why some heat treatment methods employ freezers, liquid nitrogen, or other cold receptacles, as austenite may remain until the steel is cooled beneath the Martensite finish temperature. If warps appear during the quench, it is because of retained austenite's softness that they can be straightened for a brief period of time before additional retained austenite transforms to Martensite. However, if the quenched steel is not cooled sufficiently, subsequent cooling may initiate the transformation of retained austenite to Martensite. The density of austenite's face centred cubic structure is higher than Martensite's body centred tetragonal structure, so that retained austenite's degradation will push the neighbouring Martensite outwards, causing warps or even cracks. The tempering process generally helps alleviate the possibility of the retained austenite's transformation at some point imminently or indefinitely in the future by providing enough energy to the metastable crystals to transform instead into stable ferrite and cementite. There is a specialized approach to quenching known as marquenching or martempering, in which a piece is quenched into a high temperature liquid (usually salts) long enough to equalize the piece's temperature at a point just above the Martensite start temperature. After this uniformity is achieved, the steel is allowed to cool across the Martensite start and Martensite finish temperature band. Although often done in still air, this requires a fairly thin cross section for the centre to precipitate Martensite quickly enough before other phases begin to form. Austempering introduces another meta-stable form of the iron-carbon lattice called Bainite. The two variations, upper bainite and lower bainite, form by holding the steel at a temperature slightly above the martensitic start temperature without first forming ferrite and cementite from the austenite which it precipitates from. Generally, the steel is quenched from just above critical to the martensitic start temperature, where it is held in a medium such as molten salts at a consistent temperature for a long period of time. Because bainite is not formed rapidly like Martensite, thick cross sections can have extremely long decomposition times to form fully bainite parts. Similar to pearlite, bainite is comprised of ferrite and cementite. Instead of pearlite's lamella patterns of alternating ferrite and cementite, bainite forms acicular cementite formations surrounded by the softer ferrite. Bainite exhibits an increase in hardness as the temperature at which it is precipitated is lowered. That bainite, lower bainite, is stronger than upper bainite, which precipitates closer to the Martensite start temperature. In both cases, bainite has a higher toughness, ductility, and reduced distortion when compared to Martensite tempered to achieve the same hardness. Because the bainite formation does not need to be tempered to relieve the Martensite issue of brittleness, the lack of regions of pearlite means that there is also superior wear to Martensite of a comparable hardness. Tempering is, simply put, heating steel to a certain temperature and holding it there for a certain duration. The temperature more than the time effects how much Martensite is converted back to the stable forms of the iron carbon lattice, but both work together to give energy to the metastable Martensite and allow it to overcome the threshold energy by which it decomposes. As temperature increases, a greater percentage of Martensite is able to degrade (those crystals of a certain required dislocation degradation energy and all those with a lower threshold). As time increases, some crystals 'pinned' by lower energy crystals may drop into lower energy decomposition states. The decomposition of Martensite leads to a decrease in hardness but increase in ductility and toughness. During the tempering process, high stress Martensite decomposes, and the subsequent reduction in lattice unit size relieves the associated volumetric strain. First, metastable carbides precipitate within the Martensite crystals, followed quickly by the decomposition of retained austenite to the stable ferrite. If the temperature is high enough, the initial carbide formation will instead yield cementite. Carbon migration out of the Martensite allows it to form ferrite, which is stable and of much greater ductility and toughness. Excessive tempering times, usually at higher temperatures, the Martensite is entirely degraded into ferrite and cementite, but instead of forming lamellar pearlite, the cementite collects into spheres. This spheroidized state is extremely malleable and often times exceeds the softness of a fully annealed piece of the same alloy. It should be noted that introducing additional alloyed elements into the steel dramatically changes the rates of dislocation diffusion, pinned dislocation energy, and the response of Martensite to tempering. As temperature increases, both interstitially and substitutionally alloyed elements into the iron lattice are better able to and therefore more rapidly move across concentration gradients. Homogenization therefore is an effect of both time and temperature. The most prominent case of diffusion is that of carbon on the surface of steel. Whether by the introduction of excess oxygen in the forge atmosphere to strip carbon for the formation of CO2, or the introduction of carbon to carburize steel, there will form a gradient on the surface of the steel of regions either carbon rich or carbon deficient. The depth of this gradient before reaching homogeneous steel increases approximately linearly with time, but exponentially with temperature. Finally, interstitially dissolved atoms such as carbon are better able to move through the lattice as opposed to substitutionally dissolved atoms, such as chromium and manganese, which take significantly longer to diffuse. Hot shortness is a phenomena where impurities in an alloy, such as sulphur, bind with iron and liquefy. There are a variety of elements which, when bonded with iron, will form a liquid at temperatures well within the range of normal forging conditions. This liquid, usually Iron Sulphide, melts and is drawn into the grain boundaries of the steel. Having a thin film across the grains drastically weakens their bond to neighbouring grains, and causes the steel to crumble when forged. Even extremely small amounts of sulphur, phosphorous, and other impurities can cover incredibly large areas. To combat this, the introduction of manganese instead causes these impurities to bond with it instead of iron. That Manganese Sulphide or equivalent compound melts at much higher temperatures, virtually eliminating the hot short problem.